Levosulpiride is a widely used gastroprokinetic agent in the treatment of various gastric disorders; however, its short half-life and increased dosage frequency leads to non-compliance and possible adverse effects. The prime objective of the current study was to develop a sustained-release formulation of Levosulpiride incorporating bioresorbable cellulose derivatives. Sustained-release formulations of Levosulpiride were prepared through direct compression using various cellulose derivatives such as CMC sodium, HPC, and HPMC in different polymer-to-drug weight ratios as release-modifying polymers. The powder blends and compressed tablets were then subjected to pre-compressional and post-compressional evaluation, as well as FTIR analysis. 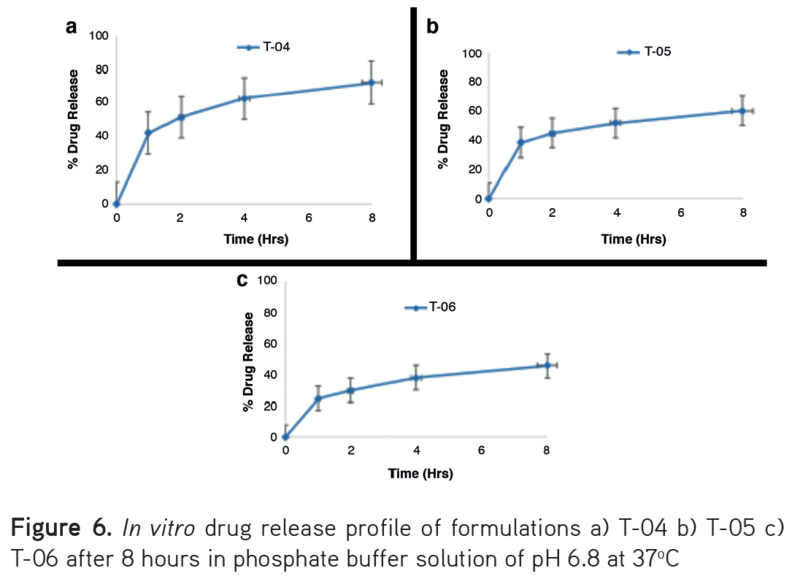 In vitro release studies were performed for all formulations of the model drug in buffer solution of pH 6.8 at a wave length of 214 nm by a UV-visible light spectrophotometer. 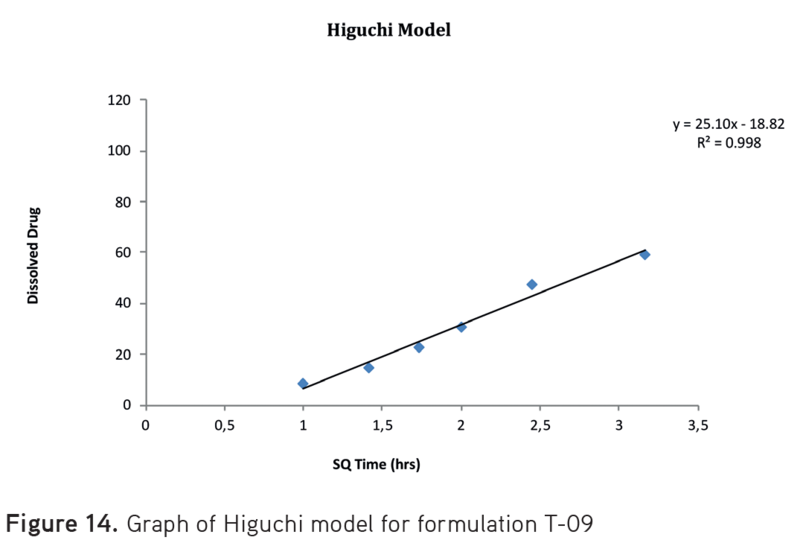 The FTIR results confirmed that the interaction between components was physical, and from the different kinetic models data, the release profile was best expressed by the Higuchi model because the results showed high linearity. The results also showed formulation F9 to be the ideal one among the developed formulations, exhibiting sustained- release behavior. Levosulpiride sustained-release matrices were prepared successfully using CMC sodium, HPC, and HPMC as the release-retarding polymer/carrier. The development of sustained drug delivery systems is a challenging task in terms of providing a constant drug release profile retaining the dosage form in the stomach or upper small intestine until all the drug is completely released in the desired time.6 An ideal oral drug delivery system will steadily release a measurable and reproducible amount of drug over an extended period of time.7 Several mechanisms are involved in the release of drugs from controlled-release formulations such as dissolution- controlled release systems and diffusion-controlled release systems. In dissolution- controlled systems, dissolution is the rate-controlling step. The drug is embedded in slowly dissolving or erodible matrix or by coating it with slowly dissolving substances, whereas in diffusion-controlled release systems, the release rate of drug is dependent on its diffusion through an inert water insoluble membrane barrier. In matrix-diffusion controlled devices, the therapeutic agent is dispersed in an insoluble matrix of rigid non-swellable hydrophobic materials or a swellable (soluble) hydrophilic substance. Among different strategies to prolong the drug action, matrix tablet formulations have gained immense popularity because they have the advantage of simple processing and low-cost fabrication.8 Matrix tablets are cost effective, easy to prepare, and exhibit predictable release behavior. Polymers are becoming increasingly important in the field of drug delivery. They owe their unique properties to their size, three-dimensional shape, and asymmetry. Polymers occur naturally (biopolymers) as well as synthesized in the laboratory on a large scale. Advances in polymer science have led to the development of several novel drug delivery systems.9 The chemical reactivity of polymers depends to a large extent on the way the monomer units are put together. Polymers can be used in film coatings to mask the unpleasant taste of a drug, to enhance drug stability, and to modify drug-release characteristics. Discovery of polymers with ideal properties still provides new avenues in pharmaceutical research. Carboxy methyl cellulose (CMC) sodium, is described by the United States Pharmacopeia (USP) as the sodium salt of poly carboxy methyl ether of cellulose. CMC or cellulose gum, often used as a sodium salt, is a derivative of cellulose (a beta-glucopyranose polymer) with carboxy methyl groups (-CH2-COOH) attached to the hydroxyl groups of the glucopyranose backbone. It occurs as white, odorless, granular powder with the molecular formula [C6 H7 O2 (OH)2 CH2 COONa] n. Figure 1 indicates the chemical structure of CMC sodium. A number of grades of CMC sodium are available such as Accelerate. Grades are typically classified as being of low, medium or high viscosity. HPMC, also known as hypromellose, is propylene glycol ether of methyl cellulose. It is a semi synthetic, inert, visco-elastic polymer used as an ophthalmic lubricant, as well as an excipient and controlled-delivery component in oral medicaments. HPMC is the most important hydrophilic carrier material used in the preparation of oral controlled drug delivery systems because of its non-toxic nature, ease of compression and accommodation to high level of drug loading.14 Figure 2 represents the chemical structure of HPMC. HPC is a derivative of cellulose, soluble in both water and organic solvents. It has the property to retain water by forming a film that prevents water loss and exhibits greater drug retarding properties than hydroxyethyl cellulose. The drug release from HPC matrices is controlled primarily by diffusion through pores and channels in the structure.15 HPC is generally used as an emulsifier, thickening agent, and film-former in tablet coatings because of its surface properties, but it lacks the property to form gel because it forms open helical coils. Figure 3 indicates the chemical structure of HPC. Medicinal products of the prokinetics class are found to be effective in the treatment of all clinical forms of dyspepsia.16 Levosulpiride, as a gastroprokinetic agent, has shown promising results in the treatment of various gastric disorders such as functional dyspepsia and non-erosive reflux disorder.17 Chemically, it is a synthetic benzamide derivative with a strong inhibitory effect on dopaminergic D2 receptors both in the central nervous system and in the GIT.18 Studies have shown Levosulpiride to be effective in the treatment of various diseases such as dyspepsia (functional or organic), diabetic gastroparesis, reflux esophagitis, iatrogenic emesis induced by drugs such as chemotherapy, calcitonin, and anesthetics, as well as non-iatrogenic nausea and vomiting.19 It also acts as a moderate agonist at the serotonergic 5-HT4 receptor and to a lesser extent on 5-HT3 receptors.20,21 The serotonergic (5-HT4) component of Levosulpiride may enhance its therapeutic efficacy in gastrointestinal disorders.22 This property, together with antagonism at D2 receptors, may contribute to its gastrointestinal prokinetic effect.17 In a randomized, double-blind trial, it was found that Levosulpiride had a similar effect to cisapride in the treatment of dysmotility-like functional dyspepsia.23 The drug is given mostly at the dosage of 25-50 mg three times a day because of its short half-life, which leads to poor treatment adherence by patients and adverse drug effects. Figure 4 represents the structure of Levosulpiride. The aim of the current work was an attempt to develop SR matrix tablets of Levosulpiride for improved patient compliance and better therapeutic effects of various polymers with different polymeric compositions. Various physical tests were performed for the formulated tablets such as weight variation, and thickness, hardness, and friability tests. The tablets were evaluated for uniformity of active ingredients by performing a pharmaceutical assay. 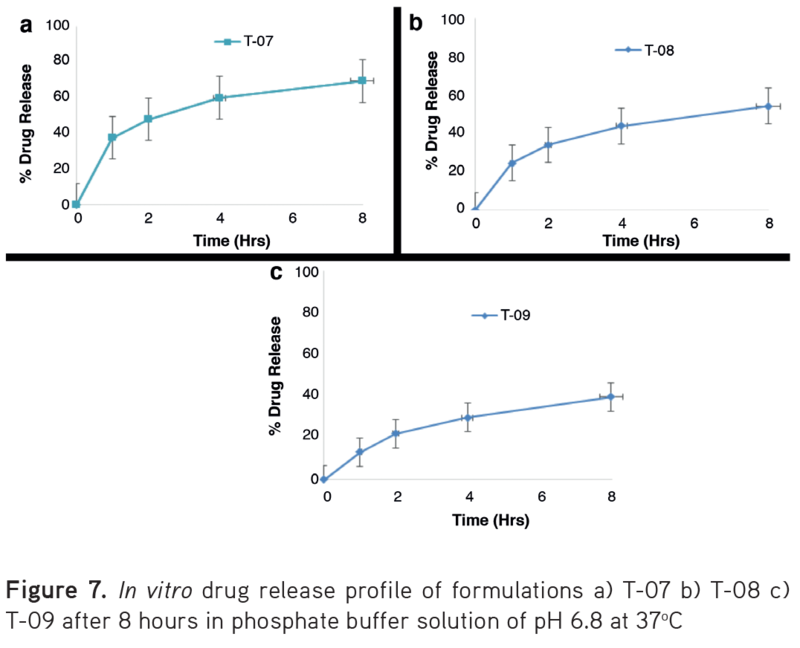 The release of the model drug from the developed matrix tablets was performed in USP phosphate buffer of pH 6.8. The mechanism of drug release was studied by subjecting drug release data to various kinetic models. For the preparation of matrix tablets of various polymeric compositions, methocel E-5 (HPMC), HPC, and CMC sodium were used as polymers, respectively. Microcrystalline cellulose PH-200 was used as a bulking agent for the tablets. Talcum and magnesium stearate were used as lubricants, respectively. De-ionized water and 0.1 N NaOH solution were used as solvents. Potassium dihydrogen phosphate, sodium chloride, and all other chemicals used were of analytical grade. Levosulpiride tablets were formulated and evaluated at Aims Pharmaceuticals (pvt) Ltd. Kahuta triangle industrial area, Islamabad, Pakistan, where all the tablet manufacturing equipment and testing instruments were available. Table 1 indicates the composition of all matrix formulations of the model drug (Levosulpiride). To formulate the tablets, the model drug, polymers, and excipients (except glidants and lubricants) were first passed individually from mesh #16 and then mixed for 15 min. The contents were mixed for a further 5 min after the addition of lubricants and glidants. The bulk was then compressed into tablets using a ZP-17 tablet compression machine (Shanghai Tianfeng, China). Before subjecting the bulk to the various physical tests, the micrometric properties of the powders were determined. The prepared formulations of the model drug were then evaluated for the various physical parameters. Powder flow plays an important role in the manufacturing of a fine tablet. 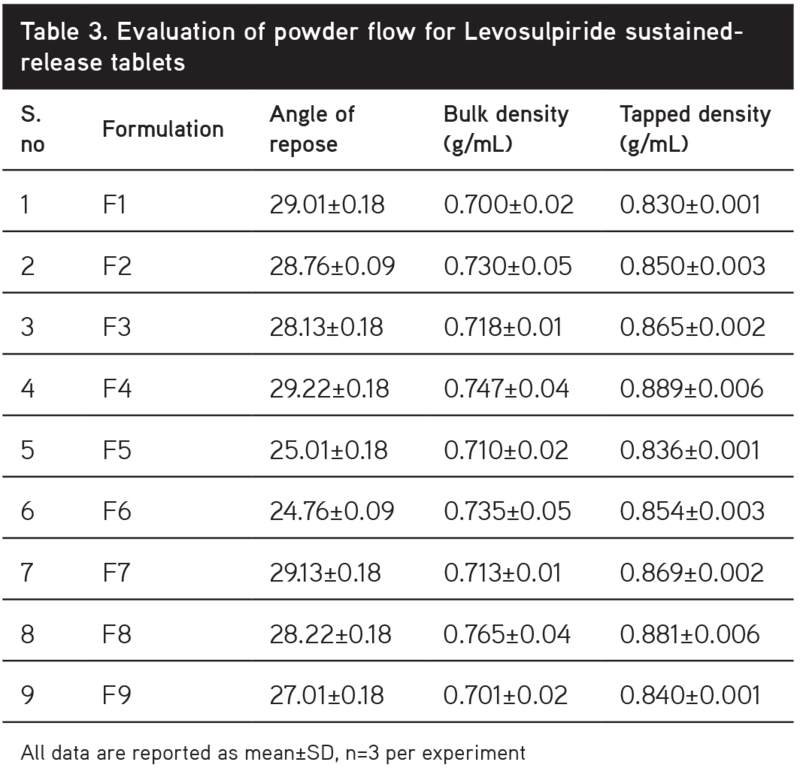 The flow properties of the powder blends were evaluated by determining the bulk density, tapped density, and angle of repose. Where M represents the mass of powder and V0 represents the bulk volume of the powder. Where M represents the mass of powder and Vt is the tapped volume of the powder. Where, h is the height in cm, r is the radius, and θ is the angle of repose. The weight variation of tablets was calculated as per the method described in the B.P using an electronic balance (Sartorius). The individual weights were then compared with the average weight for the determination of weight variation. The hardness test represents the structural integrity and the point at which the tablet breaks during storage, transportation, and handling before use. Moreover, the hardness of the tablet also affects the disintegration time. The hardness was measured using a digital hardness tester. Variation in tablet thickness may cause problems during counting and packaging. The thickness of tablets was determined using Vernier calipers. Where W1 is the initial weight of the tablets and W2 is the final weight. The tablets were also evaluated for the content uniformity by randomly selecting a specific number of tablets from each formulation and weighed on a suitable tare container. The tablets were then powdered using a pestle and mortar and a solution of Levosulpiride was prepared in a 100-mL volumetric flask by dissolving the powder equivalent to 25 mg of Levosulpiride in 0.1 N NaOH. 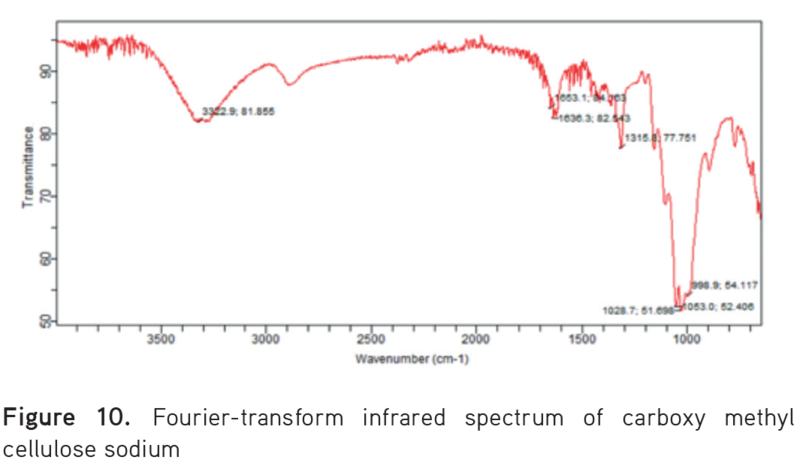 Further dilutions were made and the absorbance of the resultant solutions was measured against the standard at a wavelength of 214 nm using a UV-visible spectrophotometer. A dissolution test was performed using dissolution test apparatus USP type II (Pharma test Germany) in phosphate buffer solution (pH 6.8) for all nine formulations of Levosulpiride. For this purpose, 900 mL of buffer solution was placed in each vessel of the dissolution test apparatus and the solution was allowed to reach a temperature of 37°C. A single tablet of Levosulpiride was placed in each vessel of the dissolution test apparatus and the apparatus was operated at a rate of 50 rpm. Five milliliters of the sample were collected from each vessel after defined intervals and was filtered and diluted with the dissolution medium. After each sampling, fresh dissolution medium was added to the vessels in order to maintain the volume of the dissolution medium.24 The absorbance of the samples and standard were then measured using a UV-visible spectrophotometer. The structure and intermolecular interactions between components of the tablets were investigated using FTIR spectroscopy. The FTIR spectra of the tablets and individual components were recorded using a Thermo-Fischer Scientific Nicolet 6700 FTIR spectrometer at 8 cm−1 resolution averaging 256 scans. The spectra were collected over the 4000-400 cm−1 range. Where Q is amount of undissolved drug at time t, K is the zero order rate constant, and t is time. Where C0 is the initial concentration of drug and K is the first order constant. Where Q represents the percent of drug released in time; K is Higuchi’s constant and t is the time. Q0 is the initial amount of the drug in tablet, Qt is the amount of drug released in time (t), and KHC is the Hixson-Crowell rate constant. Where Mt / Ma is the fraction of drug released in time (t), Kkp is the rate constant incorporating the properties of macromolecular polymeric system and drug, and n is the release exponent used to characterize the transport mechanism.29 The n value is used to describe various release mechanisms for cylindrical-shaped devices as shown in Table 2. The particle size of powders was found to be in the range of 760-890 µm, which resulted in free-flow properties of the powders. The data given in Table 3 show that the angle of repose for all formulation was <30 degrees, which clearly depicts that the granules had excellent flow characteristics. Ten tablets from each formulation were taken and average thickness values were calculated. The usual thickness range of tablets weighing up to 250 mg is 3-4 mm. According to the results indicated in Table 4, the average thicknesses of the tablets of all formulations were within the specified limits. The friability of tablets should be less than 1%. Twenty tablets from each formulation were selected at random and their percent friability was calculated. According to the results shown in Table 4, all results were within the specified limits. Twenty tablets from each formulation were selected randomly. Table 4 represents the content uniformity of each formulation and it is evident that each formulation was within the official limits i.e., 95-105%. To study the in vitro drug release behavior from the polymer matrix in simulated intestinal medium, dissolution studies were conducted for all formulations. The dissolution test was performed using USP type II dissolution apparatus. The tablets were placed in 900 mL of phosphate buffer solution maintained at 37±1°C and the apparatus was operated at 50 rpm for 8 hrs. 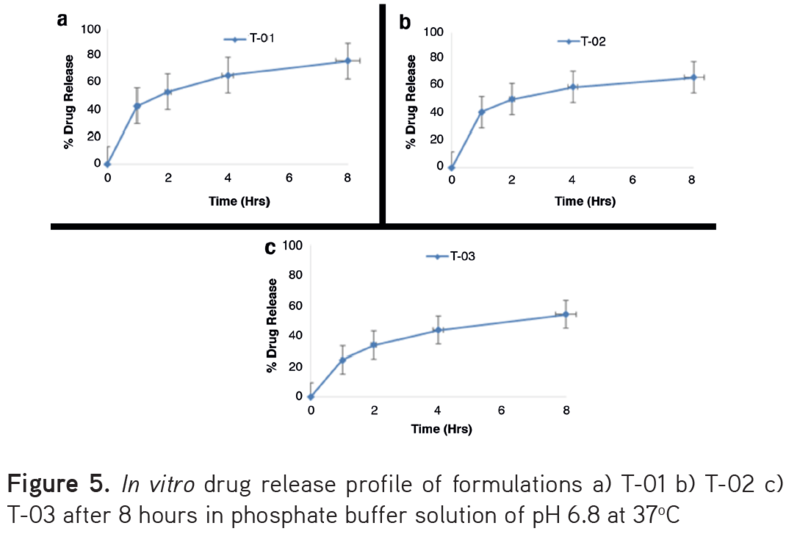 To study the effect of the polymer on drug release, the polymer-drug ratio was altered. Formulations F1, F2, and F3 contained HPMC, F4, F5, and F6 contained HPC, and F7, F8, and F9 contained CMC sodium in an increasing order of polymer drug ratio. The percentage of drug release from the matrix tablets as shown in Table 5, which indicates that the drug release from the formulations reduced as the polymer ratio increased, irrespective of the type of polymer used. The data also show that Levosulpiride release from the matrix tablet was sustained over an extended period of time at pH 6.8 and the sequence of retarding the drug release was found as CMC sodium > HPC > HPMC. Among the three polymers, CMC sodium proved to be the best retarding material and formulation 9 was found to be the best one. Figure 5, 6, 7 indicates the individual in vitro drug release profile of all the developed matrix tablet samples. Figure 8 represents the cumulative percentage release of all the formulations. 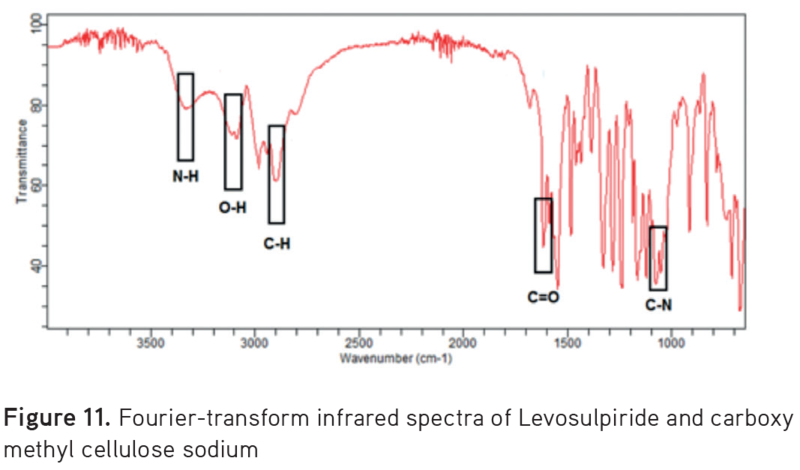 The FTIR spectra of pure Levosulpiride, CMC sodium, and their blends are given in Figure 9, 10, and 11, respectively. 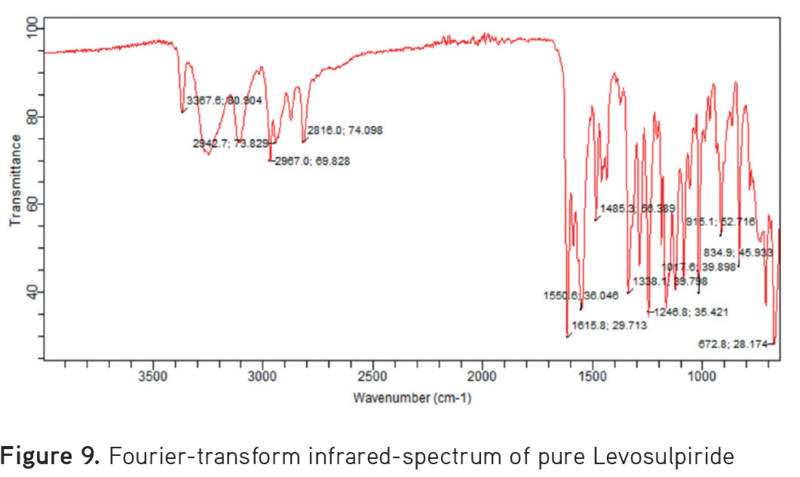 The FTIR spectrum of Levosulpiride demonstrates sharp transmittance bands for (C-H) at 2810 cm-1, which also appears in the final spectrum. The characteristic (–OH/–NH) bands in Levosulpiride at 3124 cm−1 and 3367 cm−1 also shifted to short and broader peaks, which depicts the involvement of these groups in interfacial H-bonding between the components. 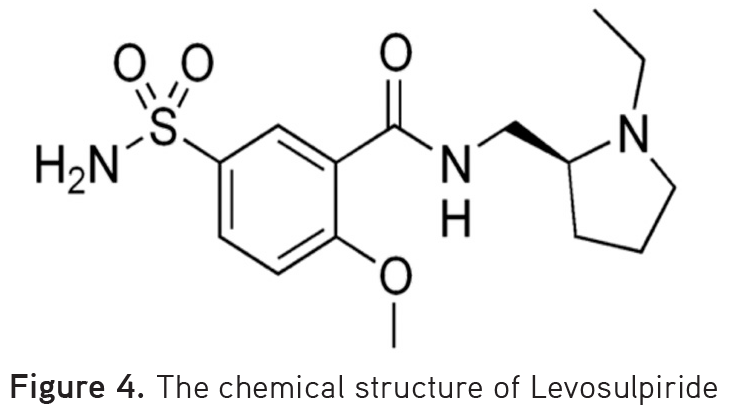 The other important contributions from Levosulpiride are the presence of an amide I band corresponding to (C=O) vibration of the acetyl group at ~1623 cm−1 and (C–N) stretching vibration at ~1060 cm−1, which can also be seen in CMC sodium. FTIR spectroscopy revealed that no chemical interaction occurred between the components. Using zero order, first order kinetic models, the Higuchi, Hixon–Crowell, and Korsmeyer–Peppas models, drug-release kinetics were investigated. The values of drug-release constant (k) and regression coefficient (r) were obtained. To examine the drug release mechanism, the data obtained from all nine formulations was fitted into the various kinetic models. The results obtained from the kinetic models are presented cumulatively in Table 6. 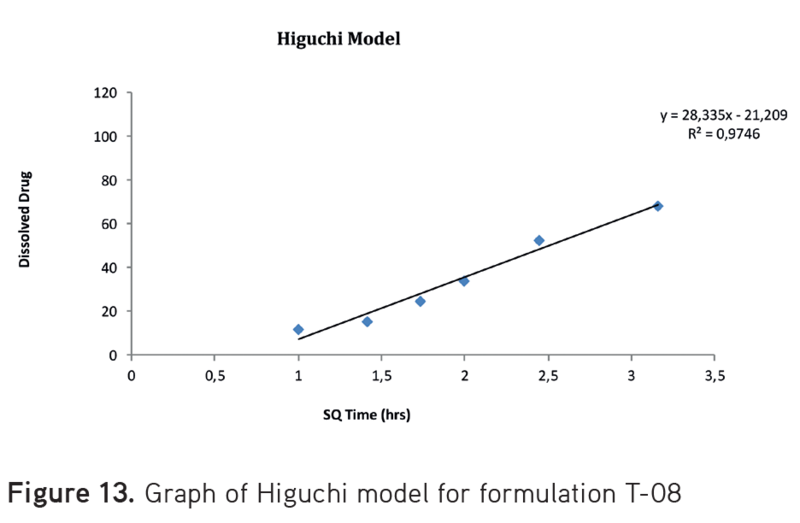 It is evident from the data that the formulations released the drug according to Higuchi’s pattern. The “n” value for all formulations was found to be greater than 0.5, which according to the Peppas model, approximates the non-Fickian diffusion mechanism, as shown in Table 6. 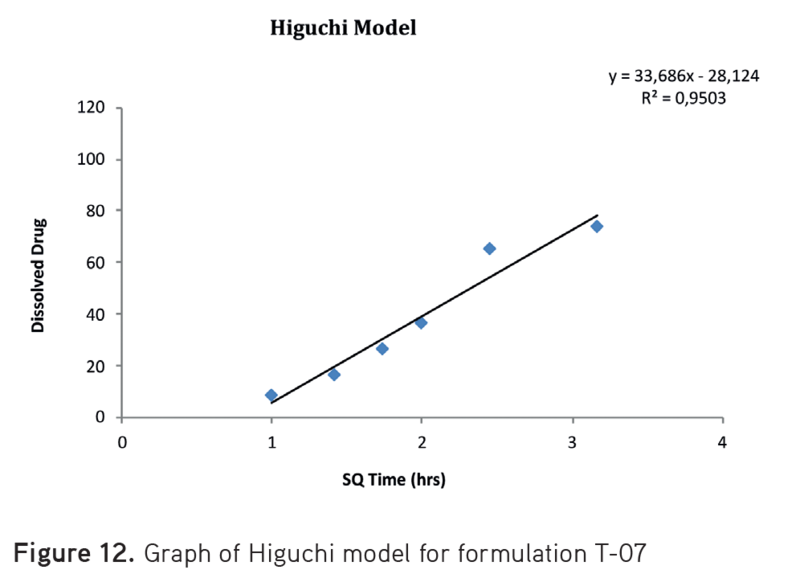 Figures 12, 13, 14 show the graphs for the Higuchi model for formulations 07-09. 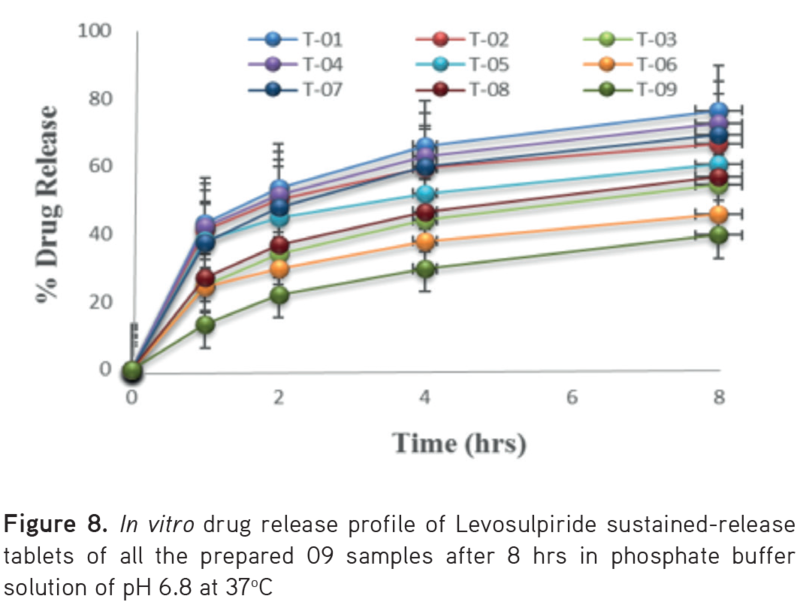 SR tablets of Levosulpiride were prepared successfully using polymers such as HPMC, HPC, and CMC sodium in varying concentrations. The particle size and drift behavior of the granules were found to be in accordance with the official standards. Direct compression method was selected on the basis of Good compressibility index of the granules. The physical properties of compressed tablets like thickness, hardness, weight variation and friability were in compliance with the official limits. Free-flowing powder facilitates the formation of tablets with ideal properties. The drug release was primarily controlled by the type and concentration of polymers and a slight change in polymer concentration resulted in altered drug release. On the basis of these results, it can be concluded that the drug release could be further prolonged if the polymers are used in combination because of their possible interaction and subsequent cross-linking. The kinetic model that best fits to the release data was found as the Higuchi’s equation, followed by zero order with non-Fickian behavior over an 8-hr period. The objective of the study was met through the formulation of a novel SR formulation of Levosulpiride, which will help to reduce dosing frequency, plasma drug level fluctuations, dose- related adverse effects and improve patient compliance. These prepared tablets can be evaluated in the future for their stability studies and in vivo behavior and to develop an in vitro-in vivo correlation. We thanks Aims Pharmaceuticals (pvt) Ltd. Kahuta triangle Industrial Area Islamabad, Pakistan for providing us the tablet manufacturing and testing facilities. Gilhotra RM, Ikram M, Srivastava S, Gilhotra N. A clinical perspective on mucoadhesive buccal drug delivery systems. J Biomed Res. 2014;28:81-97. Aulton ME, Taylor K. The Design and Manufacture of Medicines. Aulton’s Pharmaceutics (4th ed). Churchill Livingstone; New York; 2013:894. Hughes JP, Rees S, Kalindjian SB, Philpott KL. Principles of early drug discovery. Br J Pharmacol. 2011;162:1239-1249. Nokhodchi A, Raja S, Patel P, Asare-Addo K. The role of oral controlled release matrix tablets in drug delivery systems. Bioimpacts. 2012;2:175-187. Tanaka N, Imai K, Okimoto K, Ueda S, Tokunaga Y, Ohike A, Ibuki R, Higaki K, Kimura T. Development of novel sustained-release system, disintegration-controlled matrix tablet (DCMT) with solid dispersion granules of nilvadipine. J Control Release. 2005;108:386-395. Prajapati ST, Patel LD, Patel DM. Gastric floating matrix tablets: design and optimization using combination of polymers. Acta Pharm. 2008;58:221-229. Sastry SV, Khan MA. Aqueous based polymeric dispersion: Plackett--Burman design for screening of formulation variables of atenolol gastrointestinal therapeutic system. Pharm Acta Helv. 1998;73:105-112. Reddy KR, Mutalik S, Reddy S. Once-daily sustained-release matrix tablets of nicorandil: formulation and in vitro evaluation. AAPS PharmSciTech. 2003;4:61. Florence A, Attwood D. Physicochemical principles of pharmacy: In manufacture, formulation and clinical use (6th ed). 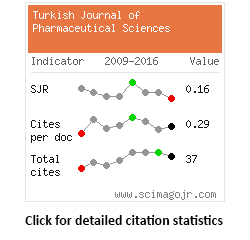 Pharmaceutical Press; 2016:296-297. Salsa T, Veiga F, Pina ME. Oral Controlled-release Dosage Forms. 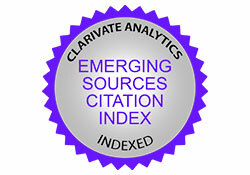 I. Cellulose Ether Polymers in Hydrophilic Matrices. Drug Dev Ind Pharm. 1997;23:929-938. Guo JH, Skinner GW, Harcum WW, Barnum PE. Pharmaceutical applications of naturally occurring water-soluble polymers. Pharm Sci Technolo Today. 1998;1:254-261. Liu J, Zhang F, McGinity JW. Properties of lipophilic matrix tablets containing phenylpropanolamine hydrochloride prepared by hot-melt extrusion. Eur J Pharm Biopharm. 2001;52:181-190. Vueba ML, Batista de Carvalho LA, Veiga F, Sousa JJ, Pina ME. Influence of cellulose ether polymers on ketoprofen release from hydrophilic matrix tablets. Eur J Pharm Biopharm. 2004;58:51-59. Colombo P. Swelling-controlled release in hydrogel matrices for oral route. Adv Drug Deliv Rev. 1993;11:37-57. Sinha Roy D, Rohera BD. Comparative evaluation of rate of hydration and matrix erosion of HEC and HPC and study of drug release from their matrices. Eur J Pharm Sci. 2002;16:193-199. Maev IV, Samsonov AA, Karmanova EA, Ivanchenko EA. The use of prokinetics for the correction of motor and tonic digestive disorders. Klin Med (Mosk). 2009;87:49-53. Lozano R, Concha MP, Montealegre A, de Leon L, Villalba JO, Esteban HL, Cromeyer M, García JR, Brossa A, Lluberes G, Sandí EI, Quirós HB. Effectiveness and safety of levosulpiride in the treatment of dysmotility-like functional dyspepsia. Ther Clin Risk Manag. 2007;3:149-155. Rossi F, Forgione A. Pharmacotoxicological aspects of levosulpiride. Pharmacol Res. 1995;31:81-94. Distrutti E, Fiorucci S, Hauer SK, Pensi MO, Vanasia M, Morelli A. Effect of acute and chronic levosulpiride administration on gastric tone and perception in functional dyspepsia. Aliment Pharmacol Ther. 2002;16:613-622. Serra J. Levosulpiride in the management of functional dyspepsia and delayed gastric emptying. Gastroenterol Hepatol. 2010;33:586-590. Karamanolis G, Tack J. Promotility medications--now and in the future. Dig Dis. 2006;24:297-307. Tonini M, Cipollina L, Poluzzi E, Crema F, Corazza GR, De Ponti F. Review article: clinical implications of enteric and central D2 receptor blockade by antidopaminergic gastrointestinal prokinetics. Aliment Pharmacol Ther. 2004;19:379-390. Herbert MK, Holzer P. Standardized concept for the treatment of gastrointestinal dysmotility in critically ill patients--current status and future options. Clin Nutr. 2008;27:25-41. Nagarsenker MS, Garad SD, Ramprakash G. Design, optimization and evaluation of domperidone coevaporates. J Control Release. 2000;63:31-39. Xu G, Sunada H. Influence of formulation change on drug release kinetics from hydroxypropylmethylcellulose matrix tablets. Chem Pharm Bull (Tokyo). 1995;43:483-487. Bourne DWA. Pharmacokinetics. In: Banker GS, Rhodes CT, eds. Modern Pharmaceutics (4th ed). Marcel Dekker Inc; New York; 2002:67. Higuchi T. Mechanism of sustained action medication. Theoretical analysis of rate of release of solid drugs dispersed in solid matrices. J Pharm Sci. 1963;52:1145-1149. Hixson AW, Crowell JH. Dependence of Reaction Velocity upon surface and Agitation. Ind Eng Chem. 1931;23:923-931. Siepmann J, Peppas NA. Modeling of drug release from delivery systems based on hydroxypropyl methylcellulose (HPMC). Adv Drug Deliv Rev. 2001;48:139-157. Abdel-Rahman SI, Mahrous GM, El-Badry M. Preparation and comparative evaluation of sustained release metoclopramide hydrochloride matrix tablets. Saudi Pharm J. 2009;17:283-288.